Monday Musings - Our Priests Need and Deserve Our Support! Truth be told, too many of us take our priests for granted. Satan has his sights on them. He attacks and seeks to destroy their vocations. How our beloved priests need and deserve our prayerful support! Yet, we do not pray for them as we ought. That has got to change. Thankfully, there are a number of efforts underway to correct that failure. I had the privilege of attending A Holy Hour in Honor of the Priesthood held on August 4, 2016 in Syracuse, New York. This occurred on the feast day of St. John Marie Vianney, patron saint of priests. The Holy Hour was sponsored by the Martin Society – whose mission is “to pray and support Priests in their vocation of service to the Catholic Church”. A special friend, who is the mother of a priest, offered an opening reflection that evening. I felt it should be shared with an audience beyond those who were blessed to be there that night. She has graciously given me permission to share it here. May the words of this mother whose love for priests knows no bounds, stir you to pray daily for our priests – ALL of our priests, without exception. I will conclude this post by sharing the prayer we all offered that night – quite appropriate for daily recitation. Cut it out and use it! “It is good that we are here. It is no surprise then that one saint after another has declared that the devil’s principal target on earth is the Catholic priest. This has been the fact since the days of the early church - but now the challenge seems greater and the stakes seem higher. We know the facts. Fewer priests to do more work. Our priests can be criticized and challenged by their own flock - receiving little support and understanding. 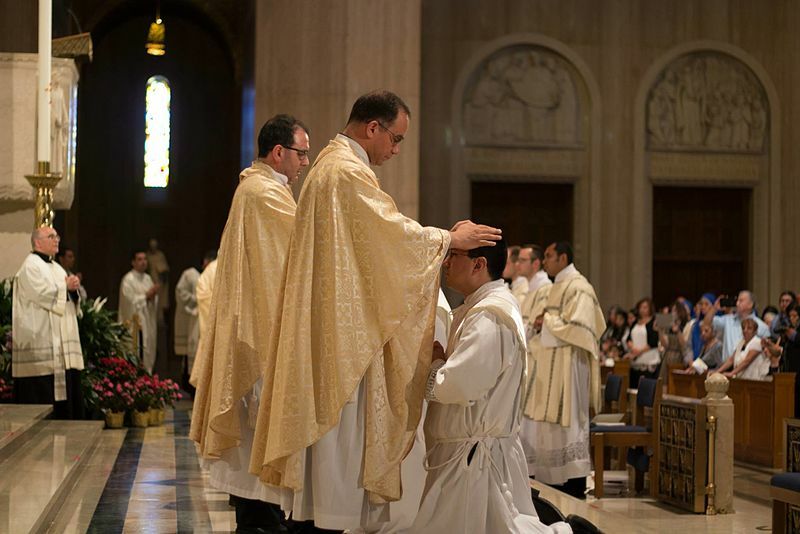 And the world’s perception of the magnificent gift of the priesthood has been tarnished by scandal - priests who have fallen under the weight of temptation and weakness. This is just one, stunning example of why we, the laity must pray! Yet through it all, every day, our priests are there for us - doing for our souls, what only a priest can. Thanks to them we have the privilege of practicing our Catholic faith. At times we know they must be overwhelmed, discouraged and unsure…unsure what lies ahead for them. Their trust in God, the grace of their vocation and the singular importance of what they do is inspiring. Yet they are men, human beings like you and me. The challenge is real; the stakes are high. There is a battle going on for souls and everyday our priests step out into the front line of battle - for us. Our faith tells us that God will equip us to fight this battle…we only need to say yes. As long as Moses kept his arms up in prayer the Israelites were winning. But Moses’ arms grew weary and as he lowered his arms in fatigue Amalek got the advantage. Aaron and Hur seeing Moses struggle - stood on either side of him and held up his arms. With this action, this inspiration, the Israelites won the battle. God used them and he wants to use us too. Our prayers CAN lift up the arms of our weary priests and obtain grace and strength for them. We must pray and sacrifice for them because unless we do, unless we can help our priests stay strong, the battle could be lost. St. Therese did not despair discovering this, but began to understand the importance of praying for priests. If even holy priests “show in their conduct their extreme need for prayers,” she wrote, “what is to be said of those who are tepid?” She learned that her vocation as a Carmelite was to be the apostle of the apostles.” - to offer prayer and sacrifice for priests. And it is from Therese, the little flower, born Therese Martin that we, The Martin Society, claim our name. We are ALL called to pray and invite others to join us - as we are doing tonight. The Holy Spirit is calling the faithful in ever growing numbers to pray and offer sacrifices for our priests. Groups like the Martin Society are forming all over the country probably all over the world. During times of great need the Holy Spirit sends great graces. Let’s claim the grace for our priests. With God’ grace and guidance let’s embrace this divine mandate to pray for our priests; to keep their arms raised in prayer and help them to win the battle for souls. And now as we begin our holy hour will you please join me in our prayer for priests found in your program. O Most Holy Trinity, Father, Son, and Holy Spirit, we adore You and we love You with all our hearts. We come before You, humbly and prayerfully, to intercede for all Your holy priesthood. Father, we give you thanks with grateful hearts for the faithful witness of so many priest-sons. Bless and protect them, Father, hold them and shelter them in the palm of Your Hand. Jesus, Eternal High Priest, we lift up to You those priests who suffer and struggle, those who are heavy-burdened, and those who have lost their way. Bless and heal them, Jesus, You Who have said, “Come to Me all you who find life burdensome… and I will give you rest.” Holy Spirit, Eternal Love of the Father and the Son, pour out your Love, Your Gifts, and Your Graces on every priest of God. Strengthened them, Holy Spirit, fill them and assure them of our love. O Mary, Mother of Jesus, Queen and Mother of all priests, intercede for these special sons of Yours. Hold them in your Immaculate Heart, cradle them in Your arms, protect them from every evil bent against them, teach them to love, and lead them at last into the arms of Your Son in Heaven. Amen.